Studies show that 92% of students fail the written permit test on their first try. 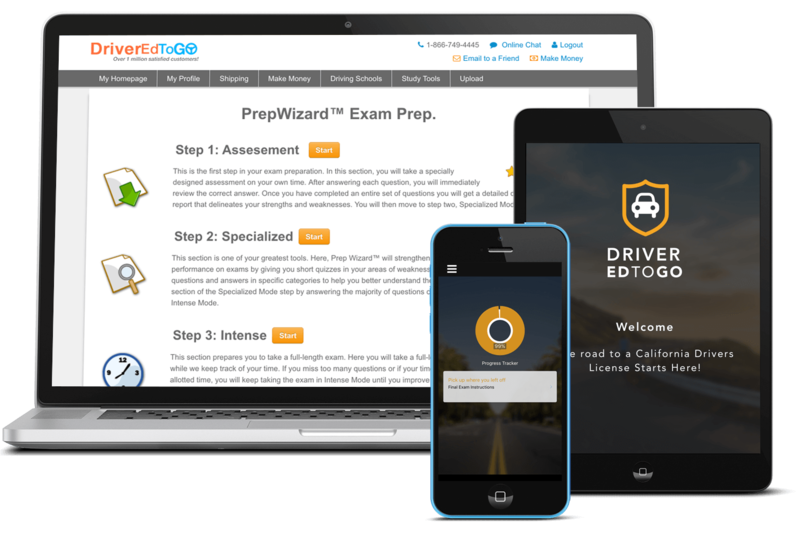 Our excusive Exam Prep Wizard software has taken actual DMV written drivers test questions and put them into a fun and easy- to-use practice test program. Passing the DMV driver test made easy! Driver Ed To Go is a complete drivers ed course on one DVD! The DVD includes interactive quizzes, a study guide, alcohol and drug awareness, and hilarious bloopers out-takes! And unlike competing products, the Driver Ed to Go DVD was actually filmed in Hollywood California! Driving lessons has never been so much fun! We offer the Driver Education course on the Internet! To get a learner's permit students are generally required to take a driver education course that includes both classroom and behind-the-wheel sections with an authorized instructor. We offer online driver education programs that allow teenagers to complete the classroom requirement from home. Please select your state to learn about the different drivers education options we offer. You can order our drivers ed workbook or sign up for any of our drivers ed home study programs online or you can call our offices at 1-800-929-7734. I need to acquire my learner's permit. What are the acceptable methods of payment for the CyberEdDriverEd.com online drivers ed, driver training, or driver education classes? We accept three methods of payment for the CyberEdDriverEd.com online drivers ed, driver training, or drivers education class. You may pay using a major credit card, an online check, OR you may choose to mail in a check/money order. While payment MUST be made prior to taking the final examination, CyberEdDriverEd.com allows you to take the online drivers ed class all the way up to the final examination without any cost to you. In other words, if you are not completely satisfied with the online driver's ed course in obtaining your learner's permit or driver's license, you are not required to pay for it!!! I have finished the CyberEdDriverEd.com online drivers ed, driver training, or drivers education class. What are the available shipping options for receiving my Certificate of Completion? There are several convenient mailing options available for you to receive the CyberEdDriverEd.com online drivers ed, driver training, or drivers education class Certificate of Completion. Choose the option that is best for you depending on your delivery time requirements. If you select US Mail, the online drivers ed class Certificate of Completion will arrive within the standard 7-10 business days. If you select Federal Express, you can choose between Priority Overnight Delivery (by or before 10:30AM the following business morning), Standard Overnight (by or before 5PM the following business day), Second Day (by or before 5PM on the second business day), or Express (by or before 5PM on the third business day). If you complete the online drivers ed, driver training, or drivers education class on a Friday, CyberEdDriverEd.com offers Saturday Federal Express Delivery (by or before 12PM). I need to acquire my learner's permit. Is it secure to pay for my CyberEdDriverEd.com online drivers ed, driver training, or drivers education class with a credit card? Yes. All personal and payment information is 100% protected. CyberEdDriverEd.com operates using the latest in SSL data encryption technology. Additionally, we offer the option of paying for your online drivers ed, driver training, or drivers education class with an online check or by mailing in a check/money order. I want to acquire my driver's license. How much does it cost to take the CyberEdDriverEd.com online drivers ed, driver training, or drivers education class? The cost of taking the CyberEdDriverEd.com online drivers ed, driver training, or drivers education class varies depending on state and format of the program. In most states, CyberEdDriverEd.com provides a few options, including an online drivers ed class, a video driver education class, and a streaming video driver education class. The cost of each of these first-time driver training or drivers education classes also vary. For information on the specific drivers ed or driver training classes available in your area and the associated costs, please choose the State where you need to complete an online learner's permit or driver's license class. What are the age requirements for enrollment in the CyberEdDriverEd.com online driver's license test? In most US states, the minimum age required to take drivers ed or driver training for your learner's permit is 15 1/2 years old, while the minimum age to earn your driver's license is 16 years old. CyberEdDriverEd.com encourages prospective students to check with the licensing authority in your state prior to enrolling in our online driver education, DVD driver education, streaming video driver education, or learner's permit classes. I have completed the CyberEdDriverEd.com internet drivers ed, driver training, or driver education class. Do I have to pass the online permit test on my first attempt? No. Upon finishing the CyberEdDriverEd.com internet drivers ed, driver training, or drivers education class, you are required to satisfactorily complete a final test that covers the same material that was covered in the online drivers ed class, including rules of the road, learner's permit, safe driving, and driver's license material. If, for some reason, your first attempt at passing the driver's test is unsuccessful, you may retake the test as many times as needed- at no additional charge. In other words, we have a 100% guarantee that all of our students pass the CyberEdDriverEd.com online drivers ed class. Does my auto insurance provider offer cost reductions to teens that have completed the CyberEdDriverEd.com online drivers ed, driver training, or drivers education class? Possibly. CyberEdDriverEd.com suggests that teens and parents check with their insurance provider to see if completing a state-approved online drivers ed, driver training, or defensive driving class qualifies you for a safe driver insurance reduction. While many insurance providers do offer safe driver discounts to new drivers who have successfully completed an online drivers education class, some do not. Do I have to use the same computer to take an online learner's permit exam as I used to complete the CyberEdDriverEd.com online drivers ed, driver training, or drivers education class? Absolutely not. After enrolling in CyberEdDriverEd.com online drivers ed, driver training, or drivers education class, courses and exams are available at any computer with internet access. This allows you the freedom to earn your learner's permit or driver's license from virtually anywhere!!! In between balancing school with extracurricular activities, I doubt that I will be able to complete the CyberEdDriverEd.com online drivers ed, driver training, or drivers education class all at once. Can I complete the program over multiple sessions? Absolutely. CyberEdDriverEd.com realizes how busy the average teen's schedule is, and so, our online drivers ed or driver training courses allow students the flexibility of starting and stopping our online driver education class as often as needed. Feel free to take a break after reviewing the driver training or driver education course materials for a while. At CyberEdDriverEd.com, students can work toward earning their learner's permit or driver's license around their own schedule and at their own pace!!! On average, how long does it take to complete the CyberEdDriverEd.com online drivers ed, driver training, or drivers education class? Most of our online learner's permit or driver's license classes require about 30 hours to complete. The total length of an online driver education or drivers ed class varies depending on the regulations of the Department of Motor Vehicles (DMV), Department of Education (DOE), or other licensing authority in your state. CyberEdDriverEd.com recommends that students select their state for a list of specific internet licensing requirements prior to enrolling in an online driver education or driver training class. I have completed the online drivers ed, driver training, or drivers education class, but have yet to complete the final exam. Can I get a refund? Of course. Refunds for your home-study online drivers ed class are available at any time prior to the shipping and processing of your Certificate of Completion for the learner's permit or driver's license. Additionally, the option to 'Pay Later' is available while registering for your online drivers ed class, so, if you are not 100% satisfied, you can simply withdrawal from the drivers education program without paying!!! Unlike many other online drivers ed programs, CyberEdDriverEd.com believes that customer satisfaction is the most important aspect of providing online drivers ed, drivers education, learner's permit, driver's license and first time driver courses, and so, we strive to make sure every one of our customers is happy!!! Does CyberEdDriverEd.com online drivers ed, driver training, or drivers education class provide any special features to assist students with learning disabilities associated with reading large amounts of text? Yes we do. Most of the online drivers ed classes available at CyberEdDriverEd.com provide a unique "Read Along" feature that plays audio of online drivers education content while you follow along. While there is an additional charge for this service, it makes the online drivers ed or driver training course much easier for those who have trouble with reading large amounts of text. How do I check if the Department of Public Safety (DPS) or Department of Motor Vehicles (DMV) in my state recognizes the CyberEdDriverEd.com online drivers ed, driver training, or drivers education class? CyberEdDriverEd.com will notify you of the approval status of our online driver education class when you select your state while registering for your online drivers ed or driver training program. If our online drivers ed or driver training is not approved by your state, a disclaimer will alert you that our online driver education class, streaming video driver education class, and DVD driver education class are to be used as supplements to a state-approved driver education program. Does CyberEdDriverEd.com grade the quizzes for the online drivers ed, driver training, or drivers education class? A short, multiple choice quiz will be at the end of each online drivers ed, driver training, or drivers education lesson. The driver education quizzes can be taken as many times as the student needs to pass the online drivers ed class. The results of your drivers ed quizzes will not factor into your final online drivers ed class score. For first time drivers, the first time driver quizzes are structured to help you prepare for the final examination. Are the CyberEdDriverEd.com online drivers ed, driver training, and drivers education classes self-timed? The majority of CyberEdDriverEd.com online driver education and driver training classes are self-timed. We do not record the amount of the time our students spend reviewing our online driver education material. It is important to know that this is not true for all online drivers education or drivers ed classes in all states. Selecting your state for specific information on first time driver requirements in your state is strongly recommended. After completing my online driver permit exam for the CyberEdDriverEd.com drivers ed, driver training, or drivers education class, how do I see if there are any other requirements for acquiring my learner's permit or driver's license? The majority of states require drivers to complete both an in-classroom driver education class and a driver training class. While CyberEdDriverEd.com provides state-approved online classroom drivers ed classes, we do not offer practical 'hands on' training. Students should locate a driving school in their area to complete the second part of the drivers education requirements after passing our online drivers ed class. In most cases, you may apply for your driver's license after you finish both parts of your drivers education, provided you meet the minimum age and learner's permit holding requirements. Again, selecting your state during registration will give you more detailed information on licensing requirements and how our online learner's permit and driver's license classes work in your state. Does CyberEdDriverEd.com offer coupons for the online drivers ed, driver training, drivers education, or driver's license classes? Not only are our online drivers ed, driver training, and drivers education class costs the lowest in the industry, CyberEdDriverEd.com offers both seasonal discounts, as well as, 'Refer a Friend' discounts all year round!!! If someone you know has recently taken a CyberEdDriverEd.com online drivers ed, driver training, or drivers education class and still has their 'Refer a Friend' referral code, you will get a discount on your online drivers ed, driver training, or drivers education class and your friend will earn a commission. If you're interested in making fast, easy money, you will receive a 'Refer a Friend' code upon completing your online drivers education program, which we encourage you share with your friends or post on your Facebook page!!! I am finishing the CyberEdDriverEd.com online drivers ed, driver training, or drivers education class. Do you offer any additional products that could help me pass the DMV written exam on the first try? Absolutely!!! CyberEdDriverEd.com offers the most advanced new driver education or driver training learning supplement, 'Exam Prep', which is designed to help you pass your written learner's permit DMV exam on your first try. 'Exam Prep' includes a catalog of hundreds of authentic DMV exam questions that are given to you at varying levels of difficulty. Drivers ed or drivers education test conditions are simulated online, so that you are prepared to pass the written DMV exam on your first attempt. Does my CyberEdDriverEd.com online drivers ed, driver training, or drivers education class Certificate of Completion expire? Yes. Your CyberEdDriverEd.com online drivers ed certificate will expire six months (or 180 days) after completing the online driver training program. In most cases, the Department of Motor Vehicles (DMV), the Department of Education (DOE), the Department of Public Safety (DPS), or other state licensing authority will not accept your Certificate of Completion after six months; requiring you to retake the CyberEdDriverEd.com online drivers ed, driver training, or drivers education class. © 2019 CyberEdDriverEd.com by Cyberactive. All rights reserved.